Toll violations may seem like a minuscule ticket to most people, but when a driver receives a notice of a $5,000 fine or a notice of their license being suspended, people’s tones change. This may seem unbelievable but it absolutely happens to more people than one may think. 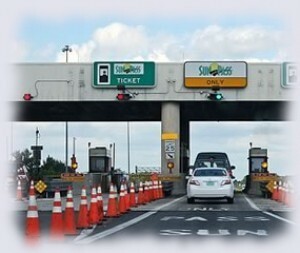 In Florida there are numerous toll stations located throughout the state. With new technology taking the place of human beings some toll stations take a picture of the vehicle’s tag and mail the owner of the vehicle the toll fee. If a person accidentally runs a toll or doesn’t have the money to pay the toll the vehicle’s owner will be mailed the toll fee. No matter who was driving the vehicle, a traffic citation is given to the owner of the car’s registration that does not pay a toll.This citation will be sent to the listed owner’s address and it will be recorded on the owner’s driving record. A common problem that frequently occurs is when a driver does not change their address with the DMV. If a person has moved and acquires a toll violation charge, the citation will be sent to their old address if they have not yet notified the DMV of their move. A toll citation may only consist of a $1.00 fine, but if a driver does not receive the notification they will not respond to the notice within the 30 day time frame. When this happens late fees are introduced and a suspended license will eventually be enforced. If a person’s license becomes suspended then they can face intensive charges if caught driving on a suspended license and they may even face jail time. In addition, if a person has gone through a toll zone several times and did not pay, they will have acquired a citation each time they did not pay. If the same person does not receive any of the citations in the mail they will receive late fees for all of the unpaid citations they accrued on their record. Depending on how many citations they were charged with they could be looking at thousands of dollars in fines and reinstatement fees. Although the fines and reinstatement fees are bad on their own, matters can get worse. If the driver accrued several citations that were not paid and the citations were not paid and resulted in license suspensions, then there license will have several suspensions on their record. Each license suspension puts three points on a person’s license. If a person receives 12 points on their license within 12 months they will automatically face a 30 day license suspension. If a person receives 18 points on their license within 18 months they will automatically receive a one year license suspension. If a person receives 15 moving violations they will face a 5 year license suspension and be deemed as a habitual traffic offender. Contact Attorney Albert M. Quirantes today to find out how he can help you fight toll violation tickets.